Find the closest local wildlife removal company near you! If you have found that you are in need of wildlife control Petoskey contact Wildlife Management & Nuisance Removal at (231) 347-2540. When you have found that there are animals in your home or business the immediate thought it what is it going to take to get them out. Secondary, is what is is going to take to keep them out. When you are hiring a wildlife control Petoskey company to assist you with the removal of the animals want to look for a company that is interested in long term solutions to your wildlife control Petoskey situation. Wildlife Management & Nuisance Removal (WMNR) is interested in helping you to locate the cause of the animal getting into your home so you are not stuck with the same situation occurring in a matter of weeks or months after your removal. When it comes to the experience of the technicians that you will be working with, you could not have better in your area. Gregg Schumaker has over 20 years of experience in the wildlife control Petoskey field. Having received an Associated in Applied Science from Haywood Community College in Clyde, North Carolina and attended Lake Superior State University’s Wildlife Biology program he is constantly continuing his education through classes and seminars, including the Michigan Animal Damage Control Association’s annual seminars. He has the hands on experience in handling all sorts of wildlife control Petoskey situations. WMNR is a member of the National Wildlife Control Operator Association, holding the position as President along with being a current member of the Michigan Animal Damage Control Association, the Michigan United Conservation Club and the National Trappers Association. To put it simply, Gregg and his staff are dedicated to ensuring that your wildlife control Petoskey situation is handled in the most effective and humane way while being the most cost effective to you, the client. When the animal removal is completed from your home, WMNR will also assist you in getting any needed repairs and sealing done on your home to prevent animals from reentering once the removal is completed. Considering the training and experience that Gregg and his team have, they are the best group to call when you need help with wildlife control Petoskey. 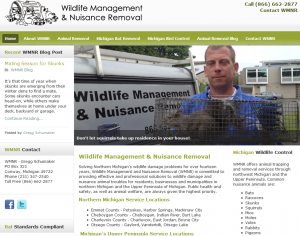 If you have a situation where you have found that you need help with wildlife control Petoskey, call Wildlife Management & Nuisance Removal at (231) 347-2540, they operate 24/7 and are available to assist you in emergency situations. If you have found yourself in need of bat removal Petoskey, call Wildlife Management and Nuisance Removal at (866) 662-2877. Most people commonly think of bats as being a rodent, this is not the case, they are in fact the only flying mammal. In Michigan, the most common species of bats that you encounter are the Big Brown Bats and the Little Brown Bats. When a bat has gotten into your home it is more often than not from them following the air currents into your perfectly climate controlled home. Bats only need an opening of ¼ of an inch to be able to enter an area. During the bat removal Petoskey process it is important in the prevention of reentry to get all of these possible entry points sealed up and closed. During the months of May and June in Michigan bats are normally giving birth, this makes for an exciting time in a bats life as over the next three to four weeks the baby bats will be learning to fly. This is normally the situation where a bat gets into the living spaces of someone’s home, they are still getting the skill of flying all nailed down and have taken a wrong turn. Getting bat removal Petoskey done on your home will help to prevent this type of entry as well as preventing colonies from forming in your attic areas. Getting help with you are in need of bat removal Petoskey is one of the safest roads to take. When dealing with bats there are two major concerns; Rabies and Histoplasmosis. In Michigan there has been testing done and 5% of the bats tested were positive for rabies. This is a concern when there is a possibility of human to bat contact including, bites and contact to the human glands, like eyes, mouth, nose and so on. Histoplasmosis is an airborne fungal organism that is found in bat guano (feces). Exposure to bat guano affects the human lungs and can resemble tuberculosis and get worse over time. Some forms of Histoplasmosis can lead to impaired vision and even blindness. Getting bat removal Petoskey done by a professional will ensure that all of the current and vital safety precautions are taken during the removal and cleanup to prevent the spread of any illness or disease the animals may have been carrying. When preforming bat removal Petoskey, there are one-way-nets and exclusion devices that can be installed to get the bats out, this would be done once the young have learned to fly to prevent them from being left unfed in the attic of your home. Then getting all of the possible entry points to your home repaired and sealed will prevent future reentry. This season if you have found yourself in need of help with bat removal Petoskey, call Wildlife Management and Nuisance Removal at (866) 622-2877 for the best help in Michigan.